The much awaited news of the participants of the most popular show Bigg Boss has been finally revealed and the names are pretty surprising. The Bigg Boss is a famous and controversial reality show of the Tellyworld which is all set for it's 11th season to get air on 1st October. The fans of Salman Khan hosted show were eagerly waiting for the names of the contestants who will be entering the Bigg Boss house this time. As revealed earlier, the theme of the show was set as 'padosi' and the audience will get to see some padosi contestants which will keep a nose on the happenings of the house and now the wait is over. 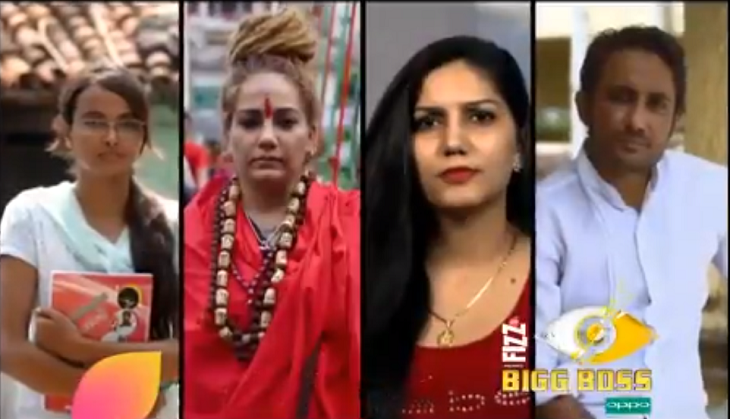 The makers of Bigg Boss revealed the names of the first four 'padosi' contestants who will be entering the show this time and will keep a watch on what is happening in the house. The makers took to the official Instagram account of the show and posted, "Meet the first four neighbours who've come from various parts of India in an attempt to win your hearts. Are you excited to meet them? #BB11"
As per the clip that was released four contestants from various parts of the country will enter the Bigg Boss house to win the hearts of the fans. These padosi contestants are Jyoti Kumari, Sapna Chaudhary, Shivani Durgah and Zubair Khan. These contestants are also a name in their field. As the latest happenings in the country revolves around self-styled Godman, underworld, poverty etc. These contestants include a peon's daugter Jyoti Kumari, who introduces herself as, "Ek mamooli chaprasi ki beti ke sapne mamooli hon ye zaroori nahi." Sapna Chaudhary who is a famous dancer from Haryana and grabbed many eyeballs when she attempted suicide once after she was allegedly harassed onlineintroduces herself as, "Agar main ashleel hoon toh Bollywood mein item number karne wali har heroine ashleel hai." Other names include those of Shivani Durgah who is a spiritual guru from Noida and introduces herself as, ""Ek talaab ki machchli gandi hai to iska matlab ye nahi ki poora talaab hi ganda ho." The fourth padosi contestant is Zubair Khan has some connection with the D-world and who introduces himself as, "Underworld mein mera nikaah zaroor hua hai, lekin apni pehchaan maine jhud banayi hai." For more updates related to the show, stay connected!